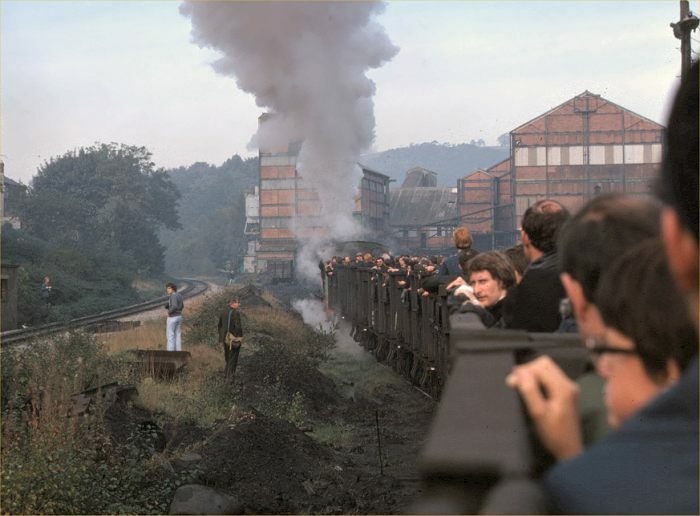 No pictures of North Wales for October 1979, so we move south to the South Wales coalfield, and the Monmouthshire Railway Society's 'Deep Duffryn Diddler' railtour of 20th October 1979. Any representatives of the H&SE will probably already be feeling a little faint. The tour ran in two parts. Firstly by DMU from Newport to Mountain Ash - at that time a closed station on the freight line from Abercynon to Aberdare, where a second train awaited, utilising the Coal Board's most luxurious rolling stock - a rake of (nearly) empty coal wagons. In we climbed, for a steam hauled tour of the very extensive Mountain Ash system - down the valley to Penrhiwceiber, and then back up to Abercwmboi - topped and tailed by two NCB steam locos. The picture was taken right at the start of the tour in the exchange sidings at Mountain Ash. The BR (ex-TVR) line is to the left, and we are heading towards the colliery behind No.8, where we will reverse before crossing the river to head down the ex-GWR lines. It goes without saying that this picture is unrepeatable, although passenger trains have returned to Mountain Ash, and some are provided by four-wheeled vehicles of questionable comfort and cleanliness.